A couple of days after my birthday in September I got a pet rat. He's white with beige markings and a crescent moon in the middle of his forehead. Two weeks later I went back and bought his brother, a more typical Halloween rat with a brown gray coat and white markings on his tummy. The first one is named Zyklus for the rat in my novel-in-progress. Zyklus is German for cycle, which is in turn a name given in honor of my Rat Terrier, Harley. The second rat is named Viktor, either short for Victory Motorcycles or Viktor Von Frankenstein, depending on my mood. I was warned against having rats and Rat Terriers in the same household, but it's worked out amazingly well. Scooter is my younger Rat Terrier; her name is also inspired by Harley's. Do you sense a theme? 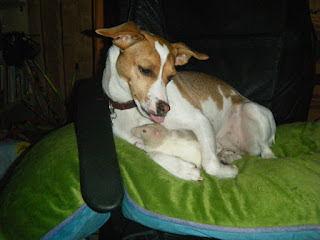 She treats the rats like her own baby puppies. Harley, on the other hand, views them somewhere between a baby and a wind up toy. I trust Scooter with them 100%. She washes them, cleans up after them and guards them from Harley. Harley isn't left alone with the, but I don't think he'd do anything to them. I just don't take any chances. The funny part for me is the incredulous attitudes I encounter from most people when they hear I have rats. You would think I was raising pit vipers and disease-ridden roaches. Ok, that's not fair, there are probably people out there who adore pit vipers and roaches. 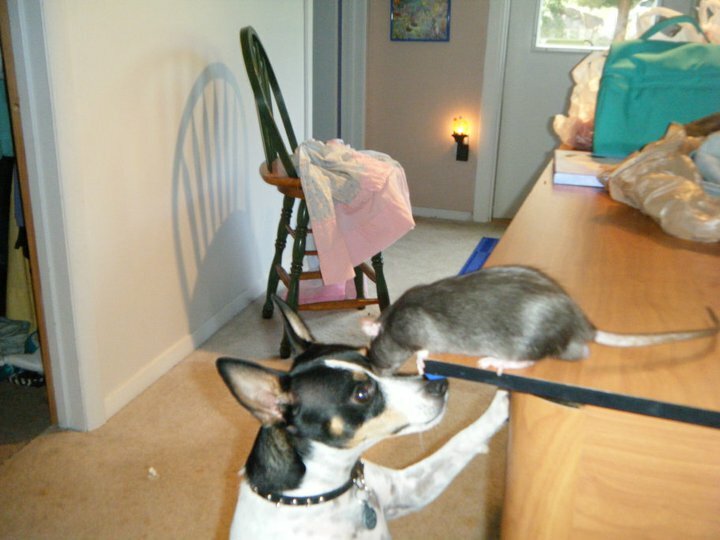 The difference is that pet rats are wonderful pets. They are smart, clean, affectionate animals who bear no resemblance to the horrible creatures you see in movies. I love having them climb on and around me while I'm on the computer. They also love to wander around on the couch while I'm reading or playing Wii. I swore I would never own another caged animal after the birds and bunny fiascos.I confess that a large part of the attraction was the fact that a rat is my favorite character in my book, but I'm glad I got them. They are entertaining and fun and I just feel sad that so many people won't give them a chance. All of which brings me to what happened today. I found a rat at Michaels made out of styrofoam and fake fur. It is much uglier than the real thing, but still looks pretty realistic. I bought one and took it to work today. When my coworker called me to say she was coming over to talk to me about something. I held it like I would my real rat and was petting it as she came around the corner. (Of course they have heard all about my new pets.) She screamed and ran back to the desk. She refused to come back over to see me until I convinced her it wasn't real. She wouldn't even touch it. Imagine how grossed out she would be by the real things. He's a wonderful looking rattie. I would have known him for a Rat Terrier in a heartbeat just from the expression on his face. You need more pictures, though.